I like to watch a lot of video box breaks on YouTube. Its always exciting to see what comes out of a new product. This evening I watched a video box break of the new 2008-2009 Topps Signature Basketball and something stood out. The serial numbering on the cards is crazy. 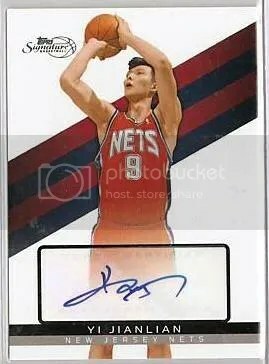 Take this autographed card of Yi Jianlian for example. It is serial numbered #’ed/6225. Doesn’t that seem a little high to have a serial number on? I could see this being 1992 and having an autographed card numbered into the thousands, but not in today’s hobby. Its ironic that many of the base cards are serial numbered lower than the autographs. I’m sure there are many non-serial numbered autographed cards on the market with smaller print runs.